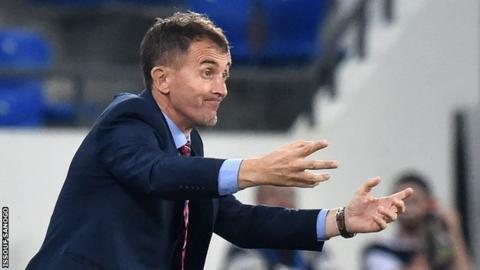 Uganda coach Milutin 'Micho' Sredojevic has told the country's FA to fulfil its contractual obligations or he we will quit and take legal action. Micho concedes the FA is handicapped "without the support of government". But he told BBC Sport: "If we can sort the situation amicably, that is good and well. But if not, I deeply regret I shall have to go the legal way." Uganda's performances are a sign that they are improving, especially considering their last appearance at the finals came in 1978. He has been heavily linked with a number of coaching posts, such as Ghana - the Back Stars' coach Avram Grant is set to leave after the Nations Cup - and South Africa. "I have a contract until the 2019 Nations Cup but the bags of a coach are always half-packed - ready to stay, ready to go," he said. "Uganda needs to decide. I am really open to everything because offers are coming. "Uganda needs to provide better facilities, logistics and to fulfil contractual obligations - if they do that, we can continue because I am already heading the project in the right direction." The BBC has contacted Fufa for comment but the governing body has yet to respond. Despite the uncertainty over his role Micho, who has been involved in African football for 16 years, believes Uganda has a bright future after a host of young players gained crucial tournament experience in Gabon. "The players have learnt that they are capable of playing at the highest level of international football - capable of playing against Egypt and Ghana, two teams we are playing in the World Cup qualifiers," he said. "We have removed that mental barrier that was in front of us. We have seen what we are capable of and whether with me or anyone else, I believe Uganda will be capable of going to the World Cup." Later this year, Uganda continue their quest to reach the 2018 World Cup with home and away qualifiers against Egypt, a home tie with Ghana and a final qualifier in Congo in November. The Cranes currently sit second in Group E with four points, two behind leaders Egypt and three ahead of Ghana while Congo have yet to win a point. In June, qualifying for the 2019 Nations Cup in Cameroon also begins, with Uganda having been drawn against Cape Verde, Tanzania and Lesotho. When devising a plan to qualify for the Nations Cup, Fufa and Micho had originally targeted the 2019 finals - only to achieve their aims two years earlier. "Whoever (leads the team) against Cape Verde, Tanzania and Lesotho, Uganda can go to the Cup of Nations in Cameroon in 2019," he said. "I count myself extremely proud man because I really left a legacy behind." Micho's assertion is up by the fact Uganda were named as the National Team of the Year for 2016 by the Confederation of African Football. His reputation has been further enhanced by his time with the Cranes. And Micho's love for African football - which has led him to coach in Ethiopia, South Africa, Sudan and Rwanda - shows no signs of diminishing. "When I look at everything that will happen, one thing is certain - I will still be in Africa, I will still be a servant and soldier of African football," he said of his future.